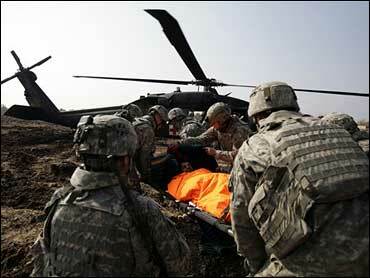 A roadside bomb killed five American soldiers Monday in Iraq's northern Ninevah province, the U.S. military said. The military did not provide more details, but the attack occurred days after a massive house explosion followed by a suicide attack left some 40 people dead in the provincial capital of Mosul. The blasts on Wednesday and Thursday have drawn attention to the security situation in Mosul, which U.S. commanders describe as the last major urban center with a significant al Qaeda presence since the terror network has been driven from its strongholds in the capital and Anbar province. Iraqi army reinforcements moved Sunday into positions near the city, 225 miles northwest of Baghdad, ahead of a planned offensive announced by Iraqi Prime Minister Nouri al-Maliki. The U.S. military, which a military spokesman said earlier this month was the last urban safe haven for al Qaeda-led insurgents, has said Iraqi security forces will take the lead in Mosul - a major test of Washington's plan to, at an undetermined date, shrink the American force and leave it as backup for Iraqi security forces. Two U.S. soldiers were killed in separate bombings in Baghdad, the military said Sunday. One Multi-National Division - Baghdad soldier died Sunday after the soldier's vehicle was struck by a roadside bomb in northeastern Baghdad, according to a statement. Another soldier was killed Saturday by a bomb during a foot patrol near Kazimiyah, a predominantly Shiite neighborhood in northern Baghdad, the military said separately. Identities were not released pending notification of relatives. The deaths raised to at least 3,934 members of the U.S. military who have died since the Iraq war started in March 2003, according to an Associated Press count. A former city official was stabbed to death along with his wife and daughter in their home in a predominantly Shiite neighborhood in northeastern Baghdad, officials said Sunday. The knife-wielding attackers stormed the two-story house late Saturday, killing Ahmed Jwad Hashim, his wife and their daughter, and leaving a visiting nephew seriously wounded, according to police and hospital officials. Facing criticism that the Iraqi government has failed to take advantage of the lull in violence to make political progress, Prime Minister Nouri al-Maliki threatened to form a new government if ministers from the main Sunni bloc refused to end a boycott of his Cabinet. Six Sunni Arab ministers quit al-Maliki's government in August to protest his perceived Shiite bias, but the main Sunni Accordance Front raised hopes it could reconsider the decision after the Iraqi parliament approved a law that would open the way for low-ranking members of Saddam Hussein's Baath party to reclaim government posts and pensions. Eight Iraqi refugees are headed to New Hampshire this week. Officials say the refugees are people who helped the U.S. military's war effort in Iraq and would have been in danger of retaliation had they remained. They will get medical checkups, English lessons and food stamps to help them get started in their new world. In return, they are expected to get a job within four and a half months and eventually repay the cost of their airfare. Since 1980, more than 5,000 refugees have been resettled in Manchester from a variety of countries. In the years that followed the first Gulf war in 1991, New Hampshire received 86 Iraqi refugees. The U.S. government expects to admit up to 12,000 Iraqi refugees by next October.